Google revealed yesterday that it’s planning to launch a new Gmail design in the coming weeks. The refreshed design will appear for Gmail users on the web, bringing it closer to the company’s tweaks for Gmail on mobile devices. 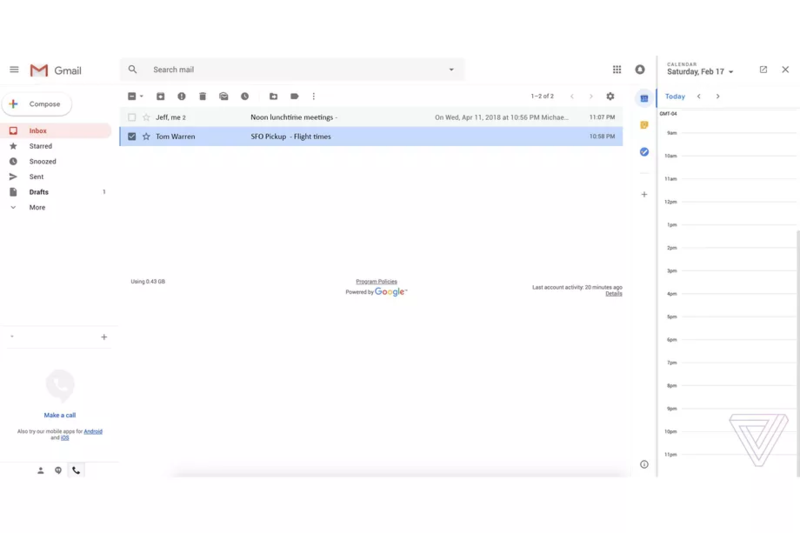 The Verge has obtained screenshots of the new Gmail design, currently being tested inside Google and with trusted partners. The new design includes some subtle elements of Google’s Material Design, and a number of new features that were originally introduced for Google’s Inbox overhaul of Gmail. Google is implementing smart replies for Gmail on the web, the same feature from mobile Gmail that provides suggestions to quickly reply to emails. A new snooze feature also lets you temporarily remove emails from your inbox until a certain time, so you can avoid certain email threads until you’re ready to reply. Snooze and Smart Reply are both currently part of Google’s Inbox app for Gmail, and both features are now making their way to Gmail on the web.